It's baack! Now though 9/13/15, Prepaid SIMs are once again on sale for 99¢ on the T-Mobile USA Website when you use the promo code SIM99 at checkout. When they aren't on sale, T-Mobile SIMs are a ridiculous $15 each, so you might want to stock up now for future use. The prepaid phone 3-in-1 SIM Starter Kits include a nano SIM with mini and micro adapters and an activation code. The activation code is required when activating a new line of service on any T-Mobile prepaid phone plan, including the $30/month 5 GB of data, unlimited messaging and 100 minutes plan, which is only available with new online activations. If you have a tablet or mobile broadband device, these SIMs can be used to activate a tablet or hotspot on any T-Mobile Prepaid or postpaid Mobile Internet plan. They also let you activate a supported tablet on T-Mobile's Free Data for Life plan which comes with 200 MB of data per month absolutely free. Prepaid SIMs can also be used as replacement SIMs for any T-Mobile account, postpaid or prepaid. 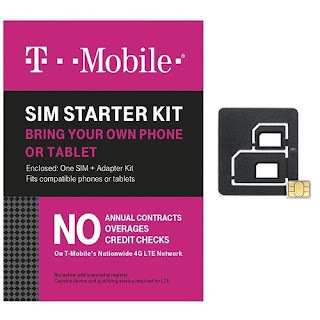 I'm disappointed that T-Mobile has switched from selling individual SIMs in mini, micro and nano sizes to using adapters which have a history of damaging phones. Maybe the adapters T-Mobile is shipping are better than than the ones that broke phones, but I'm very wary of using an adapter in any phone where the SIM slides into a blind slot. Is Your Tablet Eligible For 200 MB of Free T-Mobile Data Every Month? 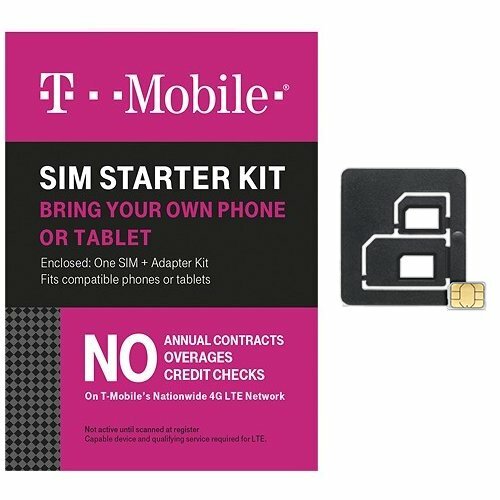 So T-Mobile is only selling these 3-in-1 kits now? It seems that a couple of months ago when the 3-in-1 kits were introduced, they still offered the choice of mini or micro SIMs too (perhaps only with the mobile internet plan SIMs that did not include an activation code). The included nano-to-micro adapter is better than the one I bought from Amazon. Bad adapters can end up making the SIM hard to put in and take out, but in my case, the nano-to-micro adapter makes it easier to pull the SIM from the S5. Worth noting that that the SIMs I received yesterday must be activated by 01/27/2018. That's long enough so not a bad idea to stock a few for emergencies - $3.15 incl tax for 3.